What happens when you take a simple matching game and add some fire - Boom Goes The Dynamite! This brilliant card game brings with it just the right amount of strategy, luck and even some simple educational math. Players attempt to collect the most cards to win by making simple matches or by using their ignite cards to make a mathematical match. Look out for those special ignite cards. They all add a very exciting twist to the game. Boom Goes The Dynamite will quickly become your new favorite game that will travel with you to friends houses and even your favorite vacation spot. This card game is a very simple game to learn how to play and won't take long at all to blow up all the cards and win. Boom Goes The Dynamite is a must have in your game closet. Grab your copy of Boom Goes The Dynamite today. Review Completed (2019-04-05) As an adult, a game of matching doesn’t sound all that great (especially if you’ve played hundreds of games with your kids). Luckily, this is only a small portion of Boom Goes The Dynamite. While remembering where cards are is an important part to winning the game, there are so many other things going on that you quickly forget it’s a matching game. Moreover you get lost in the fun game play and light strategic nature of the game. Two things most would be skeptical with: a matching game mixed with math. Let us be honest – it’s an awesome game. Mixed with what we mentioned above, you forget it’s a matching game and are more about finding pairs that work in your favor using VERY simple math all while trying to gain as many cards as possible. Brilliant! We played four times in a row before we decided to be done. Games are quick so you can demand rematches very easily. We really liked the use of the special cards and how they can run out at the end of your turn. There is so much to do between finding matches, playing special cards, retrieving your matches, replacing used cards and finally at the end of your turn replacing your ignite cards. You’ll stay busy. We initially thought the "play until you can’t make a match" rule wouldn’t work very well but we were wrong! The game play is fairly even due to the ignite cards that everyone gets their chance to be on a roll. Dynamite and Timer cards are our favorite. 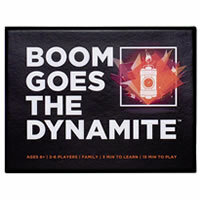 Boom Goes The Dynamite is a small game, doesn’t use a lot of space to play, is very easy to learn how to play, has short games, great included rule page, involves up to 6 players, is educational to younger kids, has very nicely made cards with a sturdy box and last but not least – it’s fun! We love including kids in our test games and we all loved it. We highly recommend Boom Goes The Dynamite to anyone. It reaches out to all types of players and just about all ages. 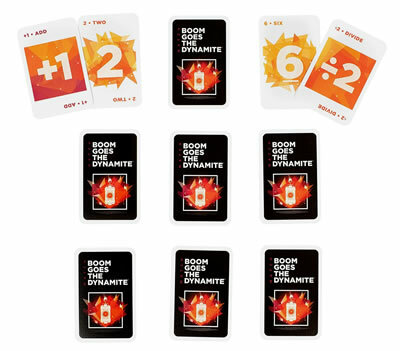 You'll get 84 cards and the official Boom Goes The Dynamite game rules and instructions. Please keep in mind that the official Boom Goes The Dynamite dice-card rules and instructions could be different depending on the game version you have. The rules below are some of the exact directions on how to play Boom Goes The Dynamite. Share with us your comments, funny stories, tips, advice, strategies, creative ways to play, questions about how to play, problems with the rules or anything you want about Boom Goes The Dynamite. All submissions will be reviewed within 24 hours. Click here to add your Boom Goes The Dynamite comments.